Seed Starting Grow Lights: Build Or Buy? 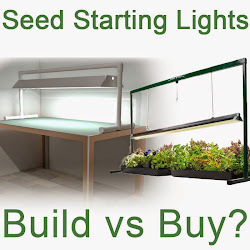 If you want a plant light for starting seeds indoors you can buy one or build your own. I'll compare the pros and cons of buying vs building a plant light system. Included are plans to build a 4' DIY fluorescent plant light stand using PVC pipe. Whether you're growing your seedlings in a windowless basement or you want to supplement the natural light from your windows a grow light system can help your seedlings get off to a great start and not grow thin and leggy from insufficient light. On Amazon you can find the Hydrofarm JSV4 4-Foot Jump Start Grow Light System which currently sells for $65.65 with free Prime shipping. It's a very popular grow light with many great reviews. It includes a metal stand that's easy to assemble and an adjustable light fixture that is easy to raise or lower. This is important because to give the seedlings the most light you want the light to be as close to your plants as possible. As the plants grow you need to increase the height of the lamp so you don't burn your plants! The Hydrofarm has one 4' T5 24W bulb that emits 2,000 lumens of light. The stand is 34" high and allows for about 30" of room under the lamp. There's enough room to fit two 72 cell seed trays like these Jiffy 72-Plant Seed Starter Greenhouses underneat the lamp. It's a nice looking and well-built set that's easy to put together. If you want to build your own grow light system it's not very difficult and many people have done it. 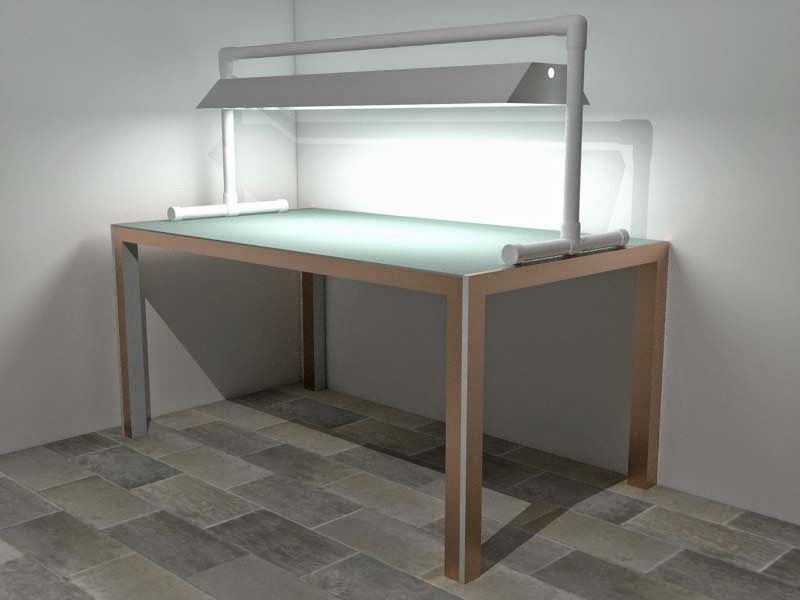 The easiest and most affordable DIY grow light stands are made from PVC pipe and fittings with a 4' fluorescent shop light fixture. You can get all of them from your local home improvement store. For the stand you'll need the following parts. I've linked to the Home Depot website to make it easy for you if you'd like to build your own grow light. If you order the parts online and use the pick up in store feature you can save a lot of time by not having to hunt around for all the parts through different aisles. They'll be ready for you when you get to the store. As of today, all the components for the PVC Plant Light Stand cost just over $15 at my local Home Depot. Since the PVC pipe is long bring a saw with you to cut the pipe down so it can fit in your car if necessary or ask one of the Home Depot plumbing associates to cut it for you. They're usually willing to do that in my experience. See the next section for measurements. It's pretty easy to put together so I won't go into too much detail. The only tools you'll need is a saw to cut the PVC pipe, a drill to make the holes for the eyebolts and a tape measure. First you want to cut the top bar. It should be long enough to fit the shop light underneath. About 56" should do it. Next cut the 4 base sections that sit on the table. 9" for each but you can make them a little longer for added stability. Whatever is left cut exactly in half for the leg uprights. Use one Tee fitting to connect the 2 short base sections and one leg upright for each side. Place the 90 elbows on top of the leg uprights and insert your top bar. Place the end caps on the exposed ends of the base. Drill 2 holes in the top bar, slide the eyebolts in from underneath and secure them with the nut. The eyebolts should be positioned towards the sides so that it's easy to attach the chains from the shop light. Use your shop light as reference. If you'd like a taller (or longer) stand you can purchase an additional length of 1-1/4" PVC pipe for about $5 to have extra pipe for longer legs (or cutting mistakes). Once you have all the pieces cut and fitted properly you can choose to use PVC primer and cement to glue it all together for better stability or keep it as is to make it easy to disassemble for storage. The PVC pipe has writing on it. If you'd like to remove the writing it comes see these tips on removing the writing. You can also paint the PVC. For the plant light, you can use a 4' shop light like this Commercial Electric 4' 2-light Hanging Fluorescent Shop Light which is currently on sale for $12.96 (normally $19.99) at my local store. The shop light takes 2 T8 32W 48" fluorescent bulbs. You'll also need bulbs for the light. There are special plant lights like these Phillips T8 32W Plant and Aquarium Bulbs which will work in the above shop light but most people use regular fluorescent bulbs just fine. These Phillips 4' T8 32W 5000k Natural Light Bulbs will work and a 2 pack is about the same price as one of the Plant bulbs. The natural lights also put out more light than the plant lights. 2,950 lumens for the Natural light bulbs vs 1,300 lumens for the plant and aquarium bulbs. For higher energy savings you can try some of the new LED tube lights. This Commercial Electric 4' LED Shop Light puts out 3,200 lumens. If you don't want to keep your existing shop light fixture these Hyperikon® BallastCompatible® 2.0 Hybrid 4FT LED Light Tubes consume only 22W of electricity for 2200 lumens and you don't even need to rewire the ballast. They're direct replacements for 4' Fluorescent tubes. If you choose to rewire the ballast they'll only consume 18W of electricity each. I'm using them this year and will write more about them. Some research has shown that the more expensive plant lights which omit some of the green spectrum and emit more of the red and blue aren't necessarily better and sometimes even worse than standard cool white 4100k tubes which are cheaper. For starting plants from seeds the intensity of light is more important than the color of the light from my understanding. Almost any fluorescent tube you can buy will work. The light in the blue spectrum is more important for plant growth while the red spectrum is more important for flowering. If you're not going to transplant your seedlings outdoors you may want to invest in the plant lights. Some people have had good luck using one warm tube and one cool tube in the same fixture. All together the cost of the stand, shop light and bulbs comes out to around $38. That's more than 40% less than the cost of the Hydrofarm light system plus you get more light output, 5,900 lumens using the Natural light bulbs instead of 2,000 from the Hydrofarm. Since you're DIY system has 2 tubes it will also spread the light out to the side a little more effectively than the Hydrofarm. If you want to have a wider light still, for a little more you can get a 4-light 4' shop light for around $50. You can use 4 bulbs in it for higher light output or you can just use 2 bulbs spaced apart for a wider light source to light wide seed starting trays more effectively. If choosing a different shop light just make sure you get one that has a cord and plug instead of one that needs to be hard-wired. Simple, just buy one thing and you're done. Uses a modern T5 bulb which is more energy-efficient and I think has a better ballast. Easy to assemble and take apart for storage with minimal tools. As I mentioned previously, if you use the links above can save a lot of time by ordering the parts online and picking them up at the store. Hunting for the right size PVC fittings and bolts in an aisle full of them can also be frustrating! The Hydrofarm uses the newer T5 bulbs whereas the DIY Shop Light Plant System uses slightly older T8 bulbs. The T5 bulbs are generally more efficient and have some other benefits over the T8 bulbs but I don't feel those benefits are that important for a seed starting light. You can find T5 shop lights but they're about twice as expensive as T8 fixtures, as are the T5 bulbs. The energy efficiency difference is at best 20% so not worth it in my opinion. Before T8 there was T12 which was even less efficient and the light wasn't as evenly distributed along the tube compared to T8 bulbs but that didn't stop anyone from using T12 shop lights to start seeds. People who built their systems with T12 shop lights can still use them successfully today. Whether you buy or DIY your seed starting lights, there are a couple of accessories that will be nice to have. A Seedling Heat Mat will help keep your seeds warm so they germinate faster. So what will you decide? Will you buy something like the Hydrofarm or build your own? This is excellent. Thank you for all the detailed and instruction and materials list! I was looking into building my own and this really nails it. Thanks for the kind feedback. Keep an eye out I'm posting some new seed starting shelf, bench and light plans soon.